The mythological writings are once again, gaining importance among the general mass and remarkably among the young readers. The same readers who turned their faces from the mythological stories and showed more interest on the pulp fictions, are now coming back to this genre of writings. Among the many reasons, working as catalysts to this is the modern presentation and style that is making the mythological stories or the story extracts attracting among the readers. Shatrujeet Nath has brought that flavor of modern presentation of mythology in his book The Guardians of the Halahala. This book is the first part of the trilogy, which starts with an asura in the prison of halahala. Halahala happens to be the deadliest prison, which came out from the ocean during the period of churning. However, here the story starts with the asura who hid the deadly poison in a dagger. The poison was later consumed by lord Shiva and that is why his throat became blue. At that time, the asura gives this dagger to Vikramaditya and his council of nine. That was done mainly because of the intention of safekeeping. What happens later to that dagger is the prime interest of the book. Being the first book of the Vikramaditya Trilogy, the Guardians of halahala is very well written, with the detailed descriptions of the mythological events. However, at some points the excessive descriptions of the kingdom politics can make the general readers a bit bored, the easy narrative and the flow of the story does keep the interest of the reader intact. The mot interesting part is the presentation of the story from numerous angles. This offers a many-folded view, which generates a thrill. 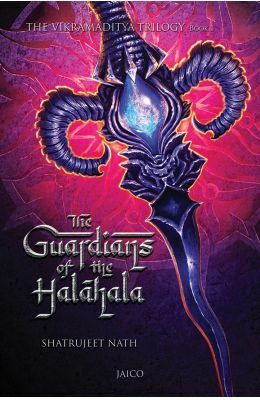 In short, the Guardians of Halahala is a must read for the mythology lovers as this book will open a new door for them, yet to be experienced.